Sometimes, two worlds are seemingly made to intertwine. 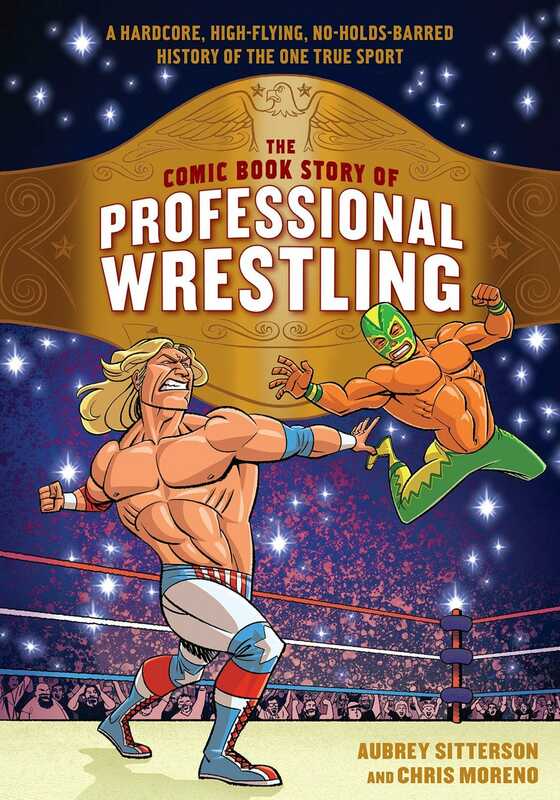 Comic books and professional wrestling fit that bill, and Aubrey Sitterson and Chris Moreno brought them together seamlessly in The Comic Book Story of Professional Wrestling. The book, available from Ten Speed Press, is a brightly colored look at the “one true sport,” from its traveling carnival roots to its modern made-for-TV iterations. This walk through history explores not only the sport’s American history, but also the styles and key figures in Mexico, the United Kingdom and Japan. Both in concept and content, this “Comic Book Story” is a creative and innovative attempt to capture a unique and long-standing form of entertainment. The best way to describe this book might be as a “non-fiction graphic novel,” if one allows a bit of an oxymoron. At 170 pages, it’s much longer than your average comic book, but the nature of the format makes it a much quicker read than a straight history piece. It’s also the latest in a series of “Comic Book Story” books from Ten Speed, including entries on baseball, beer and video games. 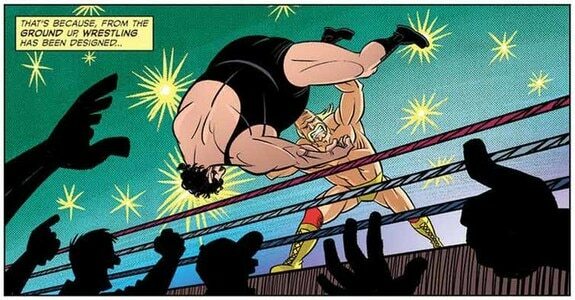 He also pointed to the importance of “singular moments” in both comic books and wrestling, with each panel capable of providing a compelling piece of the story, or even a story in itself. As such, Moreno’s contributions were vital to the success of the book. The two have worked together in the past on the graphic novel Worth, and their chemistry paid off in a big way when telling pro wrestling’s long and winding story. Moreno said that the earlier eras provided a bit of a challenge due to the lack of clear images of the key figures involved. That required “several hours of research per page” at times, but the end result was well worth the effort. “One of the strengths of doing this story in comics form is that I could extrapolate on what little reference I could find to build the characters out so they can live on the page,” Moreno said. Relive The Unforgettable and Learn Lots! Of course, all of that visual excellence could have gone to waste without strong content to back it up. Pro wrestling is full of great stories from across the globe, and Sitterson and Moreno captured them well. Overall, Sitterson’s stated goal was to put out a book that would attract wrestling fans as well as non-fans. And he sought to show both groups that wrestling was the “one true sport” not despite of its fixed nature, but because of that nature’s allowance for crafted moments meant to elicit a response from the crowd. “We hope that The Comic Book Story of Professional Wrestling will work as a kind of primer, something wrestling fans can put in someone’s hands – even if they don’t even like wrestling – and once they’re done with it, even if we haven’t made a fan out of them, they’ll understand what we already know: That professional wrestling is ‘the one true sport,'” Sitterson said via email. It would have been easy to get bogged down in the debate over when wrestling went from actual contests of strength and toughness to pre-determined works of “sports entertainment.” Instead, Sitterson and Moreno embrace that debate from the beginning, highlighting the points in time when that debate reached the forefront and showcasing times in the good ol’ days when things might not have been as real as fighters and promoters wanted the crowd to believe. This balanced approach to the business continues throughout the sport’s history. Readers are taken behind the scenes in the territory days that allowed the rise of the 1980s and 1990s “golden age,” the Monday Night Wars of the late 1990s and the modern dominance of televised products like WWE and New Japan Pro Wrestling. All of these eras are presented with fairness to most of the subjects involved, presenting the WWE’s Vince McMahon, for instance, both as he is commonly perceived and as just the most recently successful of a group of wrestling bosses seeking to dominate the scene. 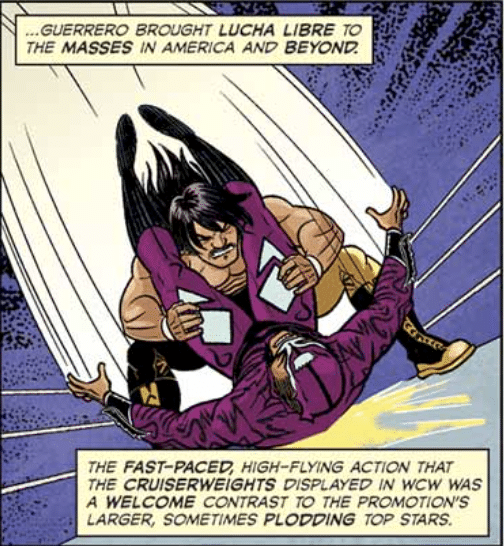 Of those eras, Moreno – who has also worked for a variety of comic companies – pointed to the ’80s and ’90s as his favorite to depict based on the non-wrestling figures involved. I would recommend this book for fans of wrestling, comic books or both without hesitation. The artwork is eye-catching, the organization is logical and consistent and the text is highly informative. I’ve been a wrestling fan off and on for most of my life, yet there were loads of interesting stories, particularly from the earlier days, that I had never heard. Even more impressive was Sitterson’s ability to constantly tie more modern stories back to those origin stories. While pro wrestling’s reliance on heroes and villains made the comic book style an easy fit, these cross references between eras and even continents made it a truly educational experience. Do yourself a favor and pick up a copy of this book, even if just to share with a friend that would appreciate it. 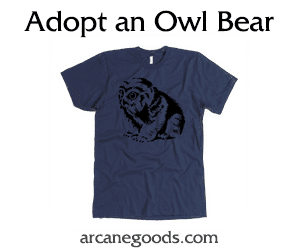 Neither of you will regret it.